Kris Kobach, former Secretary of State of Kansas, is hoping to leverage his connection to Breitbart News to successfully audition to become the United States’ next Secretary of Homeland Security. Department of Homeland Security Secretary Kirstjen Nielsen resigned yesterday after meeting with President Donald Trump at the White House. NBC News reported that her exit was “part of a massive DHS overhaul engineered and directed by top Trump adviser Stephen Miller.” Kevin McAleenan will be replacing Nielsen as acting secretary until Trump appoints a replacement to the position. Kobach has expressed an eagerness to attach himself to the Trump administration, so it’s not surprising to us that he would set his sights on the newly vacated position in Trump’s Cabinet. Kobach’s inner circle hinted to reporters in February that Trump was supportive of him joining the Trump’s Cabinet, which the White House told McClatchy was not true. Undeterred, Kobach joined Breitbart News Editor-in-Chief Alex Marlow this morning on SiriusXM Patriot’s “Breitbart News Daily” in hopes of convincing the president that he would be the best pick to fill the position left vacant by Nielsen. 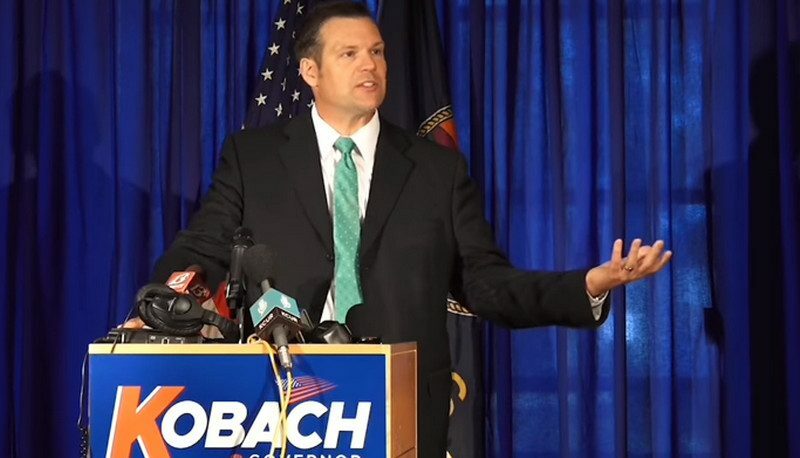 “I don’t think the department, under her leadership, was doing the things that should have been done months ago to resolve our immigration problems,” Kobach told Breitbart News Daily listeners, going on to promote his idea for fixing those perceived problems. In the last week, Breitbart has run four exclusive stories focused on Kobach. He told Breitbart on April 5 that he would “certainly consider” becoming Trump’s “Immigration Czar” if he were appointed to the position. Since then, other Breitbart News exclusives have featured Kobach’s pitches to join the Trump administration in a role overseeing immigration policy. Additionally, Kobach occasionally writes columns for Breitbart News. On Thursday, Kobach authored an article exclusive to Breitbart outlining three steps that he told Fox Business News host Lou Dobbs would solve immigration problems at the U.S.-Mexico border: publish a regulation to allow families to be detained at the border together, move immigration courts to the border so immigrants aren’t traveling into the country’s interior, and threaten to prohibit the transfer of money from immigrant workers across the border unless Mexico chips in $5 billion for Trump’s long-promised wall.